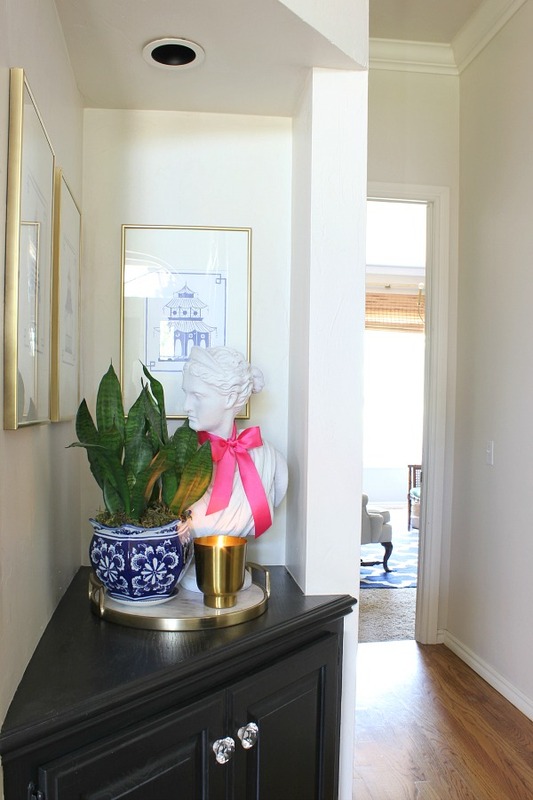 I'm so excited to share this tiny little hall nook makeover with you today! We have a little cut out nook in the hall that goes to the Master Bedroom, directly across from the Powder Bath. For the 10 years that we've lived here, I've never quite been totally happy with it. Several years ago I made a decent effort with some gold stripes (that went away when we re-painted), but honestly it's usually more of a dumping spot for random accessories I'm not using at the moment. You can't really see it from the front door or main part of the house, so it's been an "out of sight, out of mind" kind of situation. The shelf is an odd trapezoid shape which makes arranging things on it tricky, and the "back" wall which seems like it should be the focal point is half the size as the side wall where it feels like something more substantial should be hung. Really, just hanging something on one wall or the other always felt unbalanced and never looked quite right. I think I was on to something when I had the striped walls and used a trio of watercolor prints on both walls, but I moved those to the Master when I created the gallery wall around the fireplace. So, for the past few years it's just felt like a misfit space. 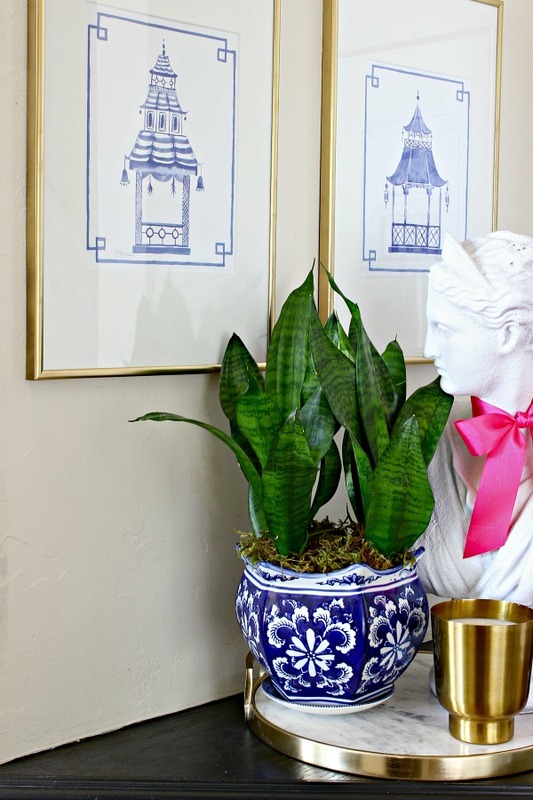 I was recently introduced to Shelby Dillon Studio, and as soon as I saw these fabulous blue and white pagoda prints, I new I had found a solution for my problem nook area! These are prints of Shelby's beautiful original handpainted artwork. This is one talented lady, there's such a large variety of prints of her work to choose from. There are four pagoda designs available to pick and choose from, or you can choose the set of all four. I received all 4 designs, and although I just used 3 here that fourth one will go in it's own special spot. I can just see all four hung in a grid over a console or dresser, though, or as a focal point on a smaller section of wall space... so pretty! I've been cutting my own mats for years, investing in a mat cutter has saved me so much money! The frames are 12x18 and the same plastic ones from Michaels that I used for my botanical wall and bird prints, I just sprayed a few of them gold for this project. As far as accessories go, I've always had a difficult time arranging things on the trapezoid shaped shelf. If I filled out the back section it seemed weird to have the front jutting out with nothing on it, and if I tried to fill in most of the space that always seemed off too. But, I found the perfect solution with this round tray! Where a rectangular tray would never work here, the round shape defines a space for accessories and offsets the odd shape of the cabinet. From the moment we bought the house, I envisioned a bust in this space, so my lady fit right in. 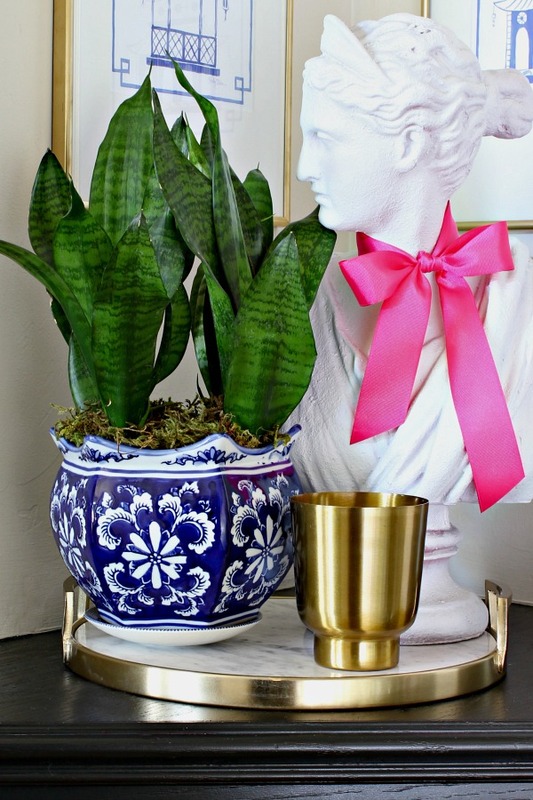 The snake plant (also called Mother-in-Law's Tongue) is perfect to add some life and greenery to the spot, they can survive in low light spaces and a virtually impossible to kill! I have three of them around the house- love them. Has anyone tried the Island Moonlight candle from Target? I've bought several of them over the past few years, it's almost identical to the pricier Volcano candles that are so scrumptious from Anthro. Now this little space makes me happy every time I'm headed down that hallway! 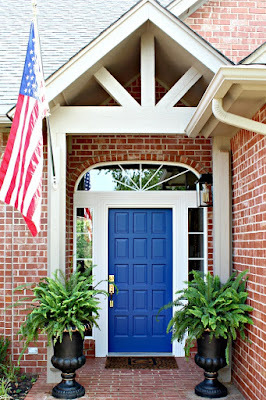 Thank you to Shelby Dillon Studio for providing product for this post. You did a great job dealing with an awkward shaped space. 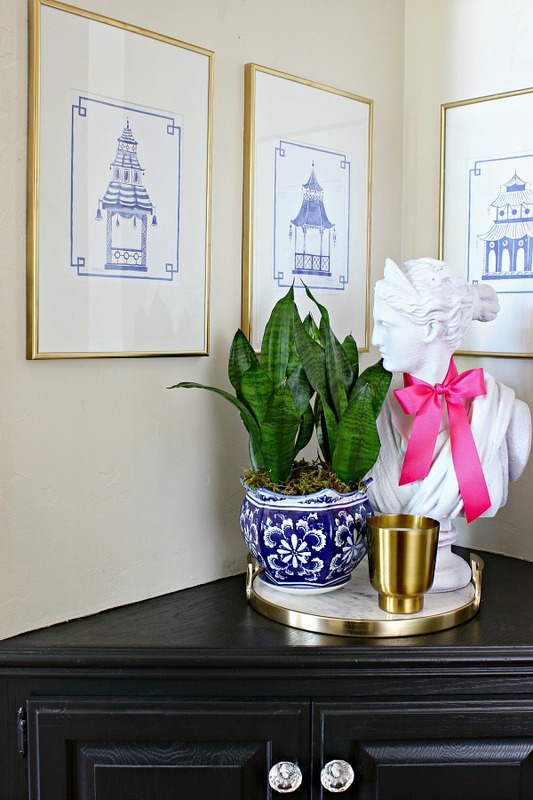 It looks great, and the bust fits perfectly! Also, thanks for the tip about the Target candle. I love the Volcano candle at Anthro but it's just so spendy. Oh good, I hope you like the candle! I know, I fork over the $$ for a few Volcano candles once a year when they have a good sale, they're a treat for sure! Love it, odd spaces can be tricky, but you made this one look amazing. 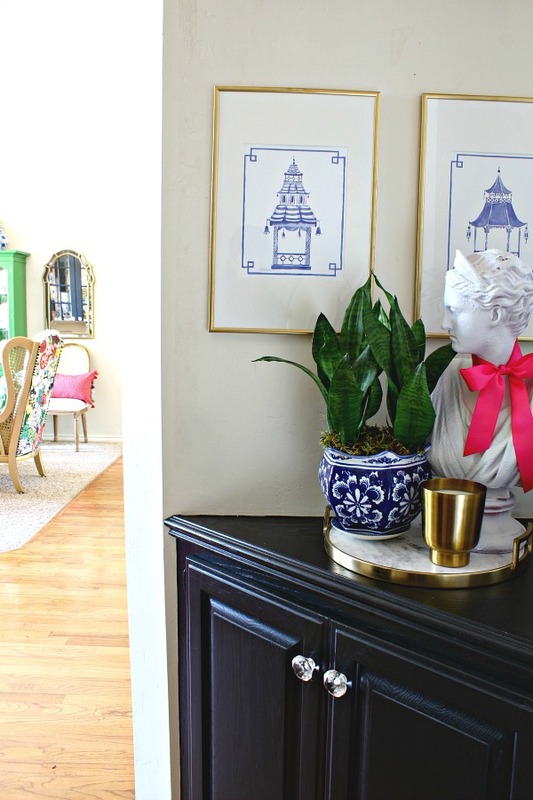 this is such a fun little nook and you really made it work and represent your style! I really love what you did with that space! It really is super tough and you totally conquered it! Thanks Shelby, I really love your prints! You are so talented and have such a beautiful variety of work! Proportion and color look so right! Thanks! So glad to finally have this little spot looking good. OMGoodness, I want a set of those prints! I can see them in several places in my home! I love your little nook now, it looks fabulous! I am so glad that you shared that you spray painted the frames! They are beautiful and look expensive now! Great job! Believe it or not, I was just looking at these darling prints today on Etsy. I like your gold frames better than the white ones pictured. Sold! I'm putting them in home office. Which, by the way, now sports a colorful rug like your entry rug. Thanks for the inspiration! Oh how funny! Well, I can verify that they're REALLY good in person! I'd love to see a pic of your office, sounds darling! So cute and I adore the prints!! I love it! That is the perfect solution and I can see why this space would be a challenge. Thank you for what you do! Thank YOU, Diane, that's really sweet! 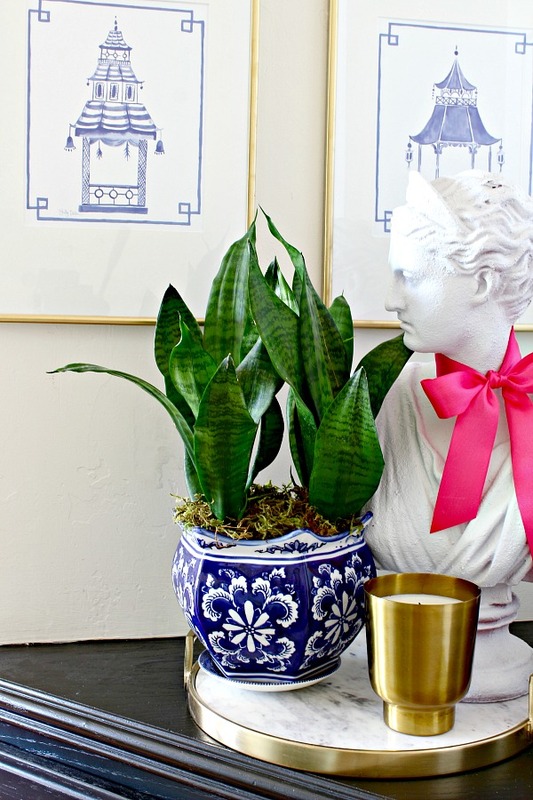 Love your plant and planter! What type of plant is it, and does your cat ignore it? Hey Seana! I gave all the details up in the post, check the paragraph above the last photo. As far as the cats go, they don't bother any of my plants so maybe they're not a good indicator? Perfection! Love those prints. Did you have to prime your frames? You are definitely a lady who knows what she wants and are creative enough to achieve it. Love it! I SHOULD have primed the frames and would recommend that, but I didn't. They will scratch if I'm not really careful with them. To each his own... I love the color! Very pretty, love the pagoda prints!!! 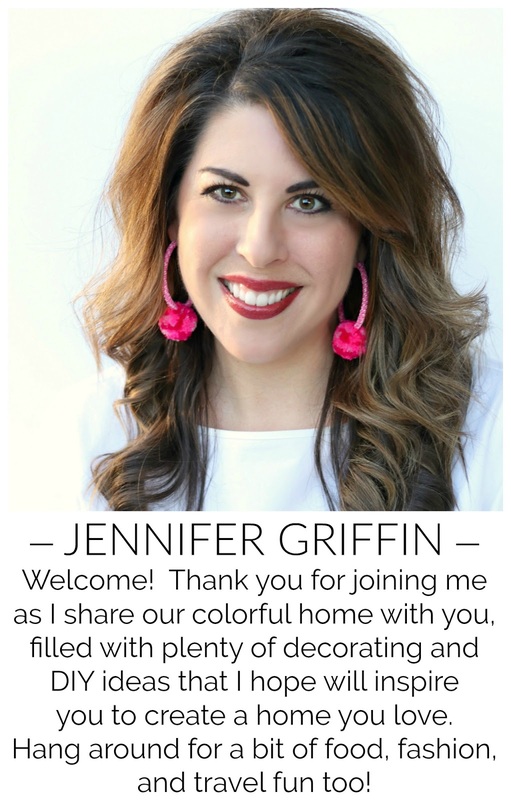 You did a great job styling this space, Jennifer! Love your tip about grabbing plastic frames from Michael's and spraypainting them. I am totally going to try that!